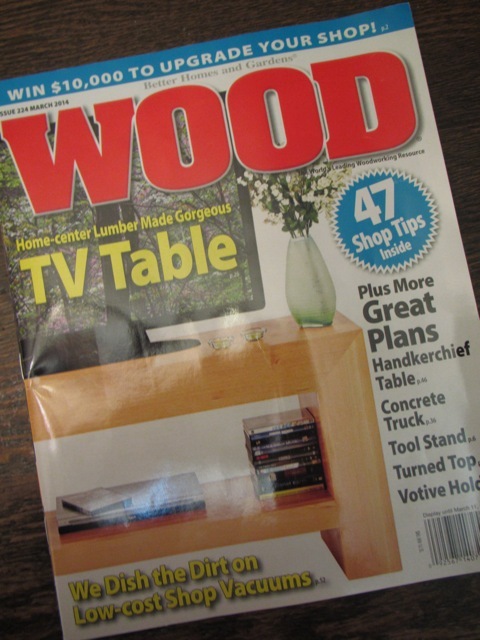 At the risk of redundancy, I just want to point out that, should you happen to see this issue of WOOD Magazine (March 2014) in the checkout lane at Lowes, I think you should buy a copy. Because I got a short piece published in it. Regular readers of this blog may recognize much of the content, as well as one or two of the accompanying photos. The article is on working wood with children, and that’s been a longtime theme of this blog. (I know, I know, I should have just titled the blog “Cute Li’l’ Apprentices” and left it at that. Hindsight, eh?) It was quite a challenge to condense 1,050 words of information into 450 words, but somehow I managed. Those with a prurient interest in redaction (and a lot of time on their hands) might compare the magazine version with the original post that inspired it. You’ll find the article on page 24, in the “Unvarnished” column. This entry was posted in Kids and tagged children, kids, Lowes, published, WOOD Magazine. Bookmark the permalink. Congrats. Did they find you or did you solicit your article to them? They solicited me, which was quite encouraging. That is quite a compliment to your blog!